There are 2 ways to ring a group of phones from a babblevoice call rule, first by call a group, the second by queueing the call. When you call a group, that is what happens immediately. All the phones in the group will start ringing and if a number of other calls come in at the same time the phones themselves will receive the calls and alert the user to those calls. 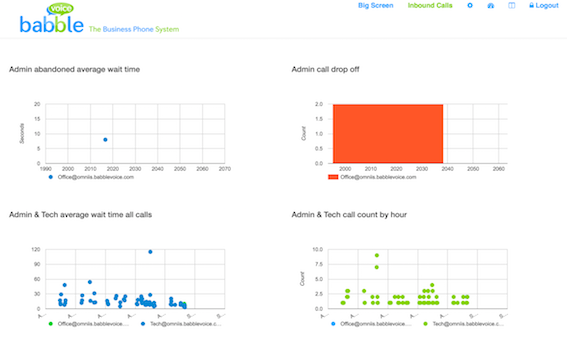 We have a number of reports which aid with the management of a volume of calls such as a live view of how many callers are waiting in line through to historic stats such as abandoned rate, queue volume and so on (example image above). Once you have decided on whether to use queueing or a simple group, if you decide on queueing you then also have options on how best to find agents to handle those calls. Becuase it tries to mimick how a group works, the queue presents the caller id of the caller on the phone when the phone starts to ring. This may seem like common sence, but there is 1 drawback to this strategy: If the caller id is presented to the phone, this means the decision as to what call in the queue is going to be put through when it is answered. Call 1, hits the queue and rings phone 1. Phone 2 wasn’t called as it was already on a call. The agent (person) who answers phone 1 goes on a toilet break. Call 2 now comes in and phone 2 is now vailable so starts to ring. Agent 2 answers phone 2, which means call in queue position number 2 has been answered before call 1. This isn’t a huge drawback in most scenarios - but should be part on your consideration. Becuase for every call, lots more phones will probably ring. This is good to grab the attention of the office, but also has a cost. When a call is answered, babblevoice has to hangup all the other phones which where presented with the same phone call (to ensure the first person which answered gets the call) before it can confidently answer the call. This may introduce a small delay in the actually connecting on the answered phone. For every call in the queue it will ring 1 phone up to the number of phones in the group at the time. 2 calls, 2 phones will ring. It decides on which phones based on least answered and other sttaistics. Every 20 seconds, the calls will switch phones. It holds back which call will sent to which phone until a phone is actuallly answered. When the phone rings, it will not show the caller id of the caller but “Queued(queuename)”, i.e. “Queued(Reception)”. This has the advantage of the first call will be strictly answered in order as the decision to place which call to which phone only after the first phone has been answered. When the call is answered the true caller id of the call is then presented on the phone. When a call comes in on 01442299280 then set the queueing strategy to enterprise then queue the call for reception queue for 3600 seconds then hangup the call. If a queue has other callers in it, it will pick the strategy of whatever those calls picked via the rule route they took. When a call comes in on 01442299280 then queue the call for reception queue for 3600 seconds then hangup the call. When a call comes in on 01442299280 then enable and add agent delay of 60 seconds for call queues enable queue position announcements then queue the call for reception queue for 3600 seconds then hangup the call. In the first example, it is a simple queue the call. In the second example, we announce to the caller the position they are in and also add a delay for the agent to write up their notes. Warning, every call route must have the same delay in, or it resets the call every call and breaks the delay. Have a look in the ‘Groups’ section for call rules there are other options including playing a recording to callers whilst they are waiting.